Wait for it, wait for it… there. Now let’s hear it again! The rub is in the scrub. “Scrubbing” is an audio term that basically means playing the same part of a song over and over again. By aggregating scrubbing data from over 75 million music lovers worldwide, Lamere was able to find the “droppiest” songs, according to the crowd, including “In The Air Tonight” by Phil Collins, “Whole Lotta Love” by Led Zeppelin, “First of the Year (Equinox)” by Skrillex, and more you can read about on MusicMachinery. 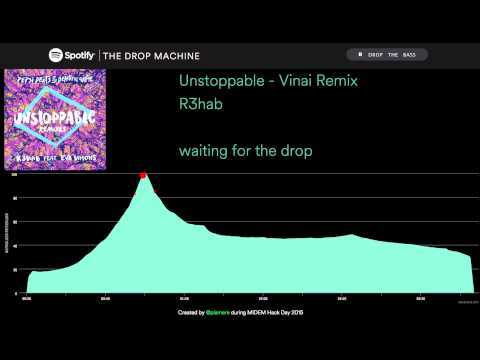 It’s fascinating that by adding up repeat attention across millions of music fans, The Drop Machine is able to do something musical like figure out when the biggest, most dramatic part of a song is. The above video mashes up a bunch of drops one after the other. The Drop Machine web app is internal-only for now, but could become available to the public. Let’s take a look at a few examples over on MusicMachinery.